"Waiting lists for donations can vary dramatically between cities--so OrganJet provides planes to fly patients to their new organs." The article focuses on Sridhar Tayur, and OrganJet: my previous posts on OrganJet are here. Competition, like similarity, isn't as symmetric as we think. Where once eBay competed with established auctioneers like Christies and Sotheby's, now they are playing catchup in the market that eBay pioneered. "Right now it’s possible to click on Christies.com and bid on a Warhol drawing, a Helmut Newton photograph and an ostrich Hermès Birkin bag. Often there is a selection of rare wines to be purchased there, too. So far the auction house says it has invested $50 million in hiring experts and building its own infrastructure. It dipped its toes in online-only auctions in 2011 with a sale of Elizabeth Taylor’s clothes and jewelry. That effort ramped up considerably last year when Christie’s held 51 online-only sales. Officials there said that number was increasing by 50 percent this year. Both Christie’s and its rival Sotheby’s introduced online bidding during their live auctions about four years ago. Their success, coupled with the realization that a new population of online shoppers is waiting to be tapped around the world, is what is driving their focus on online-only sales. While Christie’s is promoting its homegrown e-commerce business, Sotheby’s is taking a different route. In July it announced a partnership with eBay. In the next few months Sotheby’s plans to broadcast most of its live auctions on a new area of eBay’s website. And over time Sotheby’s and eBay will add more options for shoppers, including online-only sales. Sotheby’s hopes to lure eBay’s nearly 150 million customers into being as comfortable buying a 19th-century dining room table or Damien Hirst print as they are a new suitcase or a pair of sneakers. "The study, by a team of computer scientists at Northeastern University, tracked searches on 16 popular e-commerce sites. Six of those sites used the pricing techniques; none of the sites alerted consumers to that fact. "Among the study’s findings: Travel-booking sites Cheaptickets and Orbitz charged some users searching hotel rates an average $12 more per night if they weren’t logged into the sites, and Travelocity charged users of Apple Inc. ’s iOS mobile operating system $15 less for hotels than other users. "Home Depot Inc. shows mobile-device users products that are roughly $100 more expensive than those offered to desktop-computer users. And Expedia and Hotels.com steer users at random to pricier products, the study said. by Aniko Hannak, Gary Soeller, David Lazer, Alan Mislove, and Christo Wilson (all at Northeastern University). Consider the following problem: a large public electricity provider (say, in California) faces a situation where demand for electricity might, without intervention, rise above the utility's ability to generate power. Rather than resorting to rolling brown-outs, however, a forward-thinking ballot initiative has given the utility the ability to shut off the air-conditioners of individual buildings remotely. Using this ability, the utility hopes, they might be able to coordinate shut-offs so that nobody is ever uncomfortable (say, guaranteeing that every apartment's air conditioner runs during some 10 minute interval of every hour in which the apartment is occupied), but so that peak electricity usage never rises above peak power production. While this combinatorial optimization approach to the problem might be preferable to rolling brown outs, it introduces a privacy concern: the utility will now be making decisions as a function of when customers report they are at home, which can be highly sensitive information. Is there a way to solve this problem so that no coalition of customers j != i can learn about the schedule of customer i? Moreover, can we pair such a solution with a schedule of electricity rates so that no player has more than a vanishing incentive to misreport their demands? We show that the answer is "yes" to this problem, and to a broad class of welfare maximization problems that can be posed as convex programs. We give a method to compute near optimal solutions to such problems under the formal constraint of ``differential privacy'', while giving Walrasian-equilibrium like item/resource pricings which result in truth-telling as an asymptotically dominant strategy, as the size of the economy grows large (in a mild way). "As a result of the National Organ Transplant Act, more Americans have lost their lives waiting for an organ than died in world wars I and II, Korea, Vietnam, Afghanistan, and Iraq combined. The law bans almost any non-medical payment to living organ donors, whether by the government, health insurance companies, or charities. Recipients themselves can reimburse donors’ travel, lodging, and lost wages, which helps—but only when the recipients have the means and will to do so. 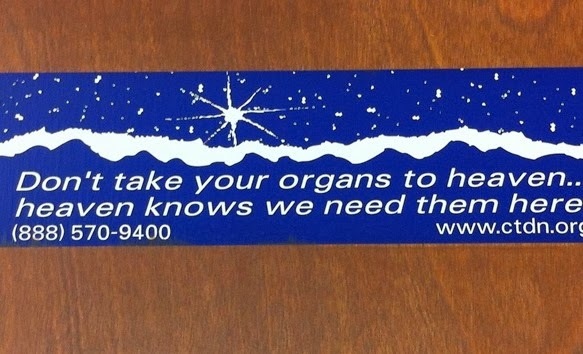 "The solution is not to create a market in organs, but to help living donors meet the considerable expenses they incur in saving others’ lives. Giving an organ costs an average of $5,000, but as the Journal of the American Society of Nephrology notes, can be as much as $20,000. According to the U.S. Census Bureau, 20 percent of American households have no discretionary funds at all, and only 8 percent can afford to spend $5,000 donating organs without dipping into their savings or going into debt. "In the coming weeks, the American Society of Transplant Surgeons, the American Renal Society, and the American Society for Transplantation will all release white papers arguing for studies on compensated organ donation. While there is no harm in studying the creation of incentives, the first step should be to get rid of the financial disincentives that currently keep thousands of living donors from being able to donate. One sensible proposal would be creating a debit card-based system not unlike the one the government employs for the victims of natural disasters, enabling government programs, private medical charities, and other people to cover donors’ expenses as they occur." "The law resulted 30 years ago from righteous revulsion at a proposal by Dr. Barry Jacobs that the government pay people to come to the U.S. to donate their kidneys. Jacobs wanted to start his own business marketing organs, and figured that the government could spend relatively little compensating these donors—maybe only $1,000 each—and then send them on their way. "Initially, Congress had simply been considering a low-profile law implementing a nationwide network to distribute cadaver organs, but when Jacobs suggested his idea in official testimony, it immediately got representatives’ attention. The prospect that the U.S. would ship thousands of impoverished people here from developing nations so that rich Americans could harvest their kidneys read like the plot of a science fiction novel. "Dr. Paul Terasaki, president of one of the three main American transplant societies, testified before Congress in 1983 that physicians “strongly condemn the recent scheme for commercial purchase of organs from living donors,” and that it is a “completely morally and ethically irresponsible proposal.” Congress reacted by adding a provision that banned all but very specific types of payment in relation to organ donation, and the rest is history." I use this blog to describe a lot of repugnant transactions, but I try not to pass judgement on them, since the nature of repugnant transactions is that some people want to engage in them and others think they shouldn't, and who am I to judge? But this recent NY Times story almost tempted me to become judgmental. I think it was this picture that did it. 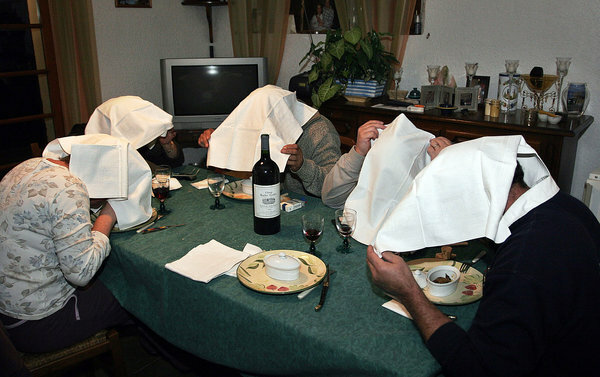 "the ortolan, a tiny songbird that gourmands, including former President François Mitterrand, used to covet, consuming the head, bones and body in a single, steaming mouthful, while covering their faces with a white napkin to conceal the act. (to get your creative juices flowing, here's a photo of a dog to go in Vietnam, sent to me by Bernhard von Stengel.. The paper below by Kannan, Morgenster, Roth and Wu is being presented today at 12:15 at the Stanford computer science theory seminar (in Gates 4b). A Pakistani court has upheld the death sentence of a Christian woman whose 2010 conviction for blasphemy led to the assassination of two politicians who supported her, a defense lawyer said Friday. Asia Bibi, a 50-year-old mother of five, had appealed before the Lahore High Court against the ruling, in which she was found guilty of insulting Islam's Prophet Muhammad, but the court rejected her appeal Thursday, her lawyer said. "We have the right to appeal in 30 days, and we will continue this legal battle by approaching the Supreme Court of Pakistan," Sardar Mushtaq said. Bibi's case drew global criticism in 2011 when Pakistan's minister for minorities Shahbaz Bhatti and eastern Punjab governor Salman Taseer were killed for supporting her and opposing blasphemy laws. Taseer was killed in the capital Islamabad by one of his police guards after visiting Bibi in jail. Bhati was killed months later by the Pakistani Taliban, who called him an "infidel Christian." Under Pakistani blasphemy laws, insulting the Quran or the Prophet Muhammad can be punished with life imprisonment or death. Experts say the laws often are exploited for personal gain. Pakistan imposed a moratorium on executions in 2008 and has never executed anyone convicted of blasphemy. Instead, such cases usually linger on appeal. Mushtaq said Bibi was arrested after Muslim women told a cleric in a village in the eastern Punjab province that she had made "derogatory remarks" about the prophet. He said the trouble began when the women objected to Bibi using their drinking glass because she was not a Muslim, setting off a heated verbal exchange. "We have a strong case, and we will try our best to save her life," he told The Associated Press. There is a set of incompatible patient–donor pairs and these pairs are matched pairwise. A match between two pairs corresponds to a paired kidney donation, where pairs exchange donated kidneys, or a paired listed exchange, where the first donor donates a kidney to the deceased donor wait-list, the first patient receives the kidney of the second donor, and the second patient receives a priority on the wait-list. We characterize the set of exchanges with the maximum number of transplants from the set of pairs. This characterization generalizes the well-known Gallai–Edmonds Decomposition Theorem. I'll be a guest today at a conference that SIEPR is hosting for the Forum of Young Global Leaders, Economic Incentives for Gender Parity. I plan to speak briefly about some of the difficulties that confront two-career couples in navigating the job market, and how those have evolved in the last half century. Here's the morning agenda; I understand that there are also breakout sessions in the afternoon. "SAN FRANCISCO — A new educational institution, the coding boot camp, is quietly emerging as the vocational school for the digital age, devoted to creating software developers. Most important, at a time when so many young people are underemployed, most graduates, especially those from highly selective boot camps, quickly find well-paying jobs. In a recent survey of 48 boot camps, Course Report, an online boot camp directory, found that three-quarters of graduates were employed, with raises averaging 44 percent from their pre-boot camp pay and an average salary of $76,000." I'll speak today at San Jose State U. on "The Economist as Engineer"
Since Fall 2002, the Charles W. Davidson College of Engineering has hosted the Silicon Valley Leaders Symposium (SVLS). The Symposium hosts industry and technology leaders to talk about business and technology trends. It also features prominent leaders who discuss broader societal and political issues that shape our life and society. Here is the full Fall schedule of speakers. The symposia take place every Thursday from 12:00 pm to 1:00 pm in the Engineering building auditorium, ENG 189.